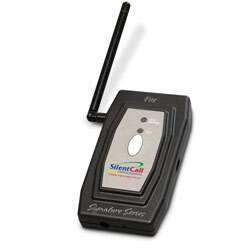 "Alerts You In Case of a Fire"
This Silent Call Signature Series Fire Alarm Transmitter is designed to be wired into a home or building fire alarm system, by supplying 12-24 volts from the fire panel. Ideal for the deaf and hard of hearing. When the fire system is activated, the fire alarm transmitter sends a signal to any Signature Series receiver up to 2000 feet away. (Receiver sold separately.) 5 year limited warranty. IMPORTANT NOTE: This transmitter should be installed by a licensed fire alarm company.